Could a Facial Recognition System be Used to Enforce the Mark of the Beast? Introduction - A facial recognition system may sound like a great thing for retailers interested in customizing their advertising (as Google already does online) to an individual shopper. However, could such advanced technology eventually be used for more sinister purposes? Our study group is presently going through Revelation chapter 13 and we recognize that there will have to be means in place to enforce this Mark of the Beast. I have included a couple of articles this month about the facial recognition system and other surveillance technology. Note: I am simply sharing items of interest. That does not imply that I agree with everything presented. The famous scene from Minority Report depicting a consumer walking into a Gap store and being instantly recognized, prompting the system to suggest new purchases based on that customer's purchase history, may have once seemed like an interesting movie fantasy, but it has now become reality. 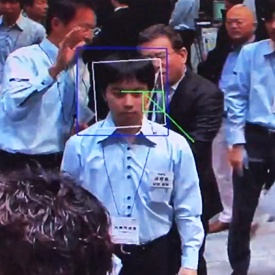 NEC has unveiled a new system in Japan that will allow stores to identify new and returning customers using a facial recognition system. Note: Do you really think this facial recognition system will only be used to identify shoppers? "In a single second, law enforcement agents can match a suspect against millions upon millions of profiles in vast detailed databases stored on the cloud. It's all done using a facial recognition system, and in Southern California it's already occurring. "Imagine the police taking a picture: any picture of a person, anywhere, and matching it on the spot in less than a second to a personalized profile, scanning millions upon millions of entries from within vast, intricate databases stored on the cloud. "San Diego is currently using software developed by FaceFirst, a division of nearby Camarillo, California's Airborne Biometrics Group. It can positively identify anyone, as long as physical data about a person's facial features is stored somewhere the police can access." Note: If the facial recognition system can't id you because you are in your car, they could just id and track your car. 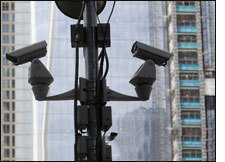 "Are you made uneasy by the soaring number of surveillance cameras being installed in big cities across the US? If so, don't take solace in your sedan: cops are using cameras to collect intelligence on cars, even when no crimes are being committed. "A recent post published on the PrivacySOS.org blog directs viewers to a YouTube video produced by PIPS Technology, the self-described world leader in automated license plate recognition, or ALPR, technology. PIPS' devices are deployed in police cruisers across the US, and in Little Rock, Arkansas, for example, cops say the equipment is well worth the $18,000-per-unit price tag. But while PIPS may be touting their product as something of a must-have for police agencies, the manufacturer is staying silent when it comes to discussing the blatant privacy violations it commits every second it's in use. "Sgt. Dedrick is right -- ALPRs allow law enforcement to do something that was unheard of only a few years ago. "Lt. Morgon explains in the advert that patrol cars pick up intelligence on every automobile within sight and logs their location and information without ever needing reasonable cause to suspect the driver has committed a crime. "Rita Sklar, the director of the local American Civil Liberties Union chapter, tells Arkansas Matters, 'I don't think I have a problem' with the scanner themselves. It's the sharing of information and how easily it can be connected to individuals, not just automobiles that raise concerns." Note: Of course, there could be good uses for a facial recognition system. How about identification of accident victims? Many motorists don't know it, but it's likely that every time they get behind the wheel, there's a snitch along for the ride. In the next few days, the National Highway Traffic Safety Administration is expected to propose long-delayed regulations requiring auto manufacturers to include event data recorders - better known as "black boxes" - in all new cars and light trucks. But the agency is behind the curve. Automakers have been quietly tucking the devices, which automatically record the actions of drivers and the responses of their vehicles in a continuous information loop, into most new cars for years. days to circle its host star. "An international team of astronomers has discovered what they are calling a new 'super-Earth,' which is seven times the size of Earth and has the right conditions to support life. "Called HD40307g, the new planet exists in a zone of a nearby star and is part of a six-planet system. "Scientists had already known about the star and its other three uninhabitable planets but after using an instrument that was more sensitive to wavelengths, they were able to discover another three, including the super-Earth." SYDNEY: Processes that have, in the Earth's distant past, enabled Antarctica to 'slip' to the equator and back again have been explained by new research. "Scientists have long known that the Earth's surface is constantly moving, independent of its daily rotation. The mechanisms for this gradual movement are understood, but the reason that the Earth's crust returns to where it began -- called 'true polar wander' -- was, until now, a mystery. VANCOUVER (Bullions Bull Canada) -- It is no secret that China is replacing the U.S. dollar with its own currency in more and more of its bilateral trading. It's apparent to all that the renminbi will soon have (at least) a co-equal status with the dollar as the global 'reserve currency'. "The collapse in value of our paper currencies is accomplished through our morally/intellectually bankrupt central banks flooding the world with this (un-backed) paper. In other words, the entire global economy is already drowning in an ocean of these paper currencies. It is thus little surprise that these same central banks are now swapping their own paper for gold at the fastest rate on record. "It is in this context that we see a shift taking place where the U.S. dollar as (current) reserve currency is being steadily replaced by the renminbi. Some numbers here are in order. A recent article in China Daily noted that for much of Asia the renminbi is already the reserve currency. "A 'renminbi bloc' has been formed in East Asia, as nations in the region abandon the U.S. dollar and peg their currency to the Chinese yuan . . .
"And now seven out of 10 economies in the region -- including South Korea, Indonesia, Malaysia, Singapore and Thailand -- track the renminbi more closely than they do the U.S. dollar . . . ."
Pope: Christ Was Not a Prophet! "In a startling statement made during his Monday Angelus to the faithful, Pope Benedict declares Jesus Christ was no prophet. "Pope Benedict declared that 'Jesus does not describe the end of the world, and when He uses apocalyptic images, He does not act as a "seer." On the contrary, He wishes to ensure that His disciples in every age remain unmoved by dates and predictions.'" "Three amphibious warships with 2,500 Marines aboard back to the eastern Mediterranean to remain on standby off Israel's shore in case they are needed to evacuate American citizens. "The United States have never before evacuated American citizens from Israel." Note: Here is a very recent story I added last minute. I don't know if it will happen but the situation continues to develop and the Bible tells us where all this is headed. Sources close to the French Defense Ministry reported Friday, Dec. 7, that a Western-Arab military intervention against the Assad regime is due to begin shortly with the participation of the US, France, Britain, Turkey, Jordan and other anti-Assad Arab nations. debkafile: The reference is to Saudi Arabia, the UAE and Qatar's special forces. Our military sources add that the French aircraft carrier Charles De Gaulle carrying a complement of marines is deployed in the Mediterranean, having joined the USS Eisenhower Carrier Strike Group and at least five British warships which are also carrying a large marine force. In the second and third weeks of November, British and French naval forces, plus 2,600 special ops combatants from both nations, performed landing-and-capture exercises against fortified locations on the coast and mountains of Albania as practice for potential operations against similar terrain in Syria, where the Alawite Mountains loom over the coastal towns of Latakia and Tartus. The troops landing there would head for the Alawite Mts. to prevent Assad and his loyal units from retreating to his mountain stronghold and fighting on from there - as he plans to do if he is forced to flee Damascus. French sources told Le Point magazine that the NATO mission for Syria, including the UK and the US, would be modeled on the Western intervention in Libya in 2011. It would combine an aerial blitz with ground action by special forces for destroying Assad's chemical weapons stocks, his air force and his air defense systems. Summary: The world is rapidly changing and this will likely even accelerate in the years just ahead. Facial recognition systems? - just keep a smile on your face - your redemption is drawing nigh!